Times are hard in the South after the Civil War. Alexandra Jamison's parents want her future secured through an arranged marriage. She chooses to follow her heart and become a teacher at Fisk University, the first Freedman's School in the United States. Her decision comes at great personal cost when her father disowns her. Sylas Rutledge, the new owner of the Northeast Railroad Line, is in town for a business deal. He comes from Colorado and isn't accustomed to the genteel ways of Southerners. He enlists Alexandra's help in learning how to conduct himself in Nashville business circles. Can a romance between a man from the Wild West and a Southern Belle survive the strains of the post-Civil War South? 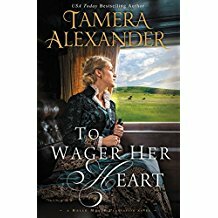 Tamera Alexander is one of my favorite, go-to authors. Her Belle Meade series is not only beautifully written but painstakingly researched. I spent many pleasurable hours reading this book. If you're a fan of Historical Christian Romance, I think you'll enjoy this story of finding love after unbearable tragedy. Disclaimer: Neither the author nor the publisher paid me for a favorable review. All opinions are solely based on my reading of this book. Hi, To Wager Her Heart sounds good. I'll add it to my TBR list.